The accept outlet of the cleaner is tangential / radial and the purpose is partly to eliminate cavitation and turbulence and partly to convert some of the kinetic energy to pressure. The entrance of the cleaner is made as a half circle and during 180 degrees the flow is accelerated into the cleaner body. The purpose of this configuration is to reduce friction losses to a minimum. The exterior surface of the new Helix cone is smooth and the interior surface is equipped with a threaded profile. By using the flow turning process we get a harder surface, an exact centre line, a perfect roundness of the cone and we can make a double entrance of the thread stabilizing the rotating flow. The lower cone in polyurethane material is equipped with an interior threaded profile which facilitates the removal of heavy impurities. The unique design is a substantial improvement of the spiral concept. Reject outlet can be either horizontal or vertical. Low pressure drop due to the design of inlet and accept part of the cleaner. Less power consumption. The cleaner can operate at very low accept counter pressure which reduces the head of the pump. Another contribution to less power consumption. No blocking tendencies at fluctuating operating conditions such as pressure and consistency. 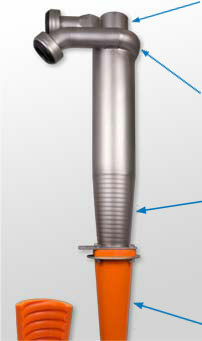 Operation at high consistency is possible due to the “pumping” effect of the spiral cone. No dilution water is needed. Improved cleaning efficiency due to the spiral cone concept. Specific material composition allows operation above 100 degree C.